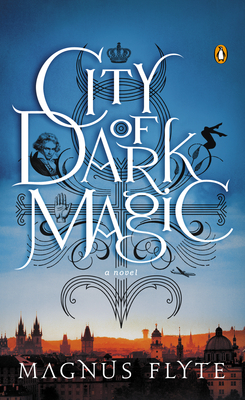 The cover of City Of Dark Magic. I’ll admit it — it was this quote by Conan O’Brien on the cover of City of Dark Magic by Magnus Flyte that initially made me pick the book up. And I was expecting to be disappointed. After all, what book could possibly live up to a quote like that? Well, I wasn’t disappointed. City of Dark Magic is just as fantastically uncanny as Conan O’Brien’s quote suggests. Graduate student Sarah Weston has worked hard to get where she is. And her hard work has paid off. She has just been offered a dream job. She is to journey to Prague, reside in a castle, and catalog Beethoven’s letters and papers — all for a tidy (and sorely needed) sum. Only, what has happened to the professor who originally had the job? Surely he couldn’t have committed suicide like everyone seems to be saying he did. And her otherwise level-headed roommate tells her that Prague contains a hell portal. Even armed with these warnings, Sarah has no idea just how weird her life is about to get. Who is murdering the academics working at the Prague Castle museum? What was that weird mark left on her ceiling in Boston, and why is she seeing it in Prague? Who is that strange dwarf that delivers her job offer? He can’t really be immortal, can he? What is the secret of Beethoven’s “Immortal Beloved”? And what is the deal with handsome Prince Lobkowicz? Sarah is drawn to him, but can he be trusted? Through it all is Prague — drawn broodingly and layered under quilts of history and the people who inhabited it. The city breathes like another character. Indeed, it is hard to imagine a better, or even different, setting for the book. But for all it’s good points (and there are many), the plot has a cobbled-together feeling. Perhaps this is suited to a story set in a city with such a varied history. Regardless, the pace and characters keep the plot moving. Overall, City of Dark Magic is a fun book. However, with themes as varied as ambition, fatherhood, and social class, this book packs more than just a fluffy good read. It strikes a good balance between entertainment and mental gymnastics that will serve the reader well. I recommend it. Interested? Read an excerpt via Google Books. Note: I bought this book for myself, and it is available for purchase by the general public.